This solution uses Yeastar S-Series VoIP PBX and CyberData SIP Intercoms and Paging Endpoints, providing an advanced SIP Paging Solution based on IP technology. This solution helps you to build a whole paging solution, with Yeastar S-Series PBX acting as a SIP server for CyberData registration while CyberData taking charge of paging management. Intercom between CyberData Intercoms and Yeastar IPPBX extensions. Page different paging groups by zone number in CyberData SIP Paging Server. The Logic is demonstrated in the diagram as below. 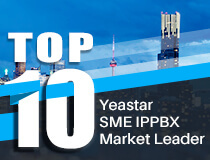 Yeastar S-Series VoIP PBX offers SIP accounts for CyberData devices including SIP Paging Server, SIP Paging Adapter, SIP Intercom, SIP Paging Amplifier and SIP Speaker to register as PBX extensions. So that other IP phones and software phones in the PBX can easily reach CyberData devices and paging. 2. Log on Yeastar VoIP PBX, and create extensions for CyberData registration. Also, please create extension as below with the same method. 2. Register CyberData Products to Yeastar VoIP PBX’s extensions. +48V DC : SIP Paging Server and SIP Paging Adapter. +8 to +12V DC/ 1000mA : All intercoms. +12V DC/ 1000mA for SIP speakers. In this guide, we connect CyberData to a PoE Switch. Note: The default IP of CyberData device is 10.10.10.10, Please change the IP to the same segment of PBX. 1. Change the CyberData devices’ IP address. Now, we take SIP Paging Server 301 as an example. First, change the SIP Paging Server’s IP address to 192.168.100.2, in this part, you may need to add an IP address to your PC, such as 10.10.10.11, then log on SIP Paging Server with the default Username/Password: admin/admin. Then go to the page “Network”, and change the IP to 192.168.100.2. After the IP changing, you need to save the configuration and reboot SIP Paging Server by clicking the button on the WEB page. Please change other CyberData devices’ IP address with the same way. After logging on the SIP Paging Server, go to the SIP page in the up-middle side of the page, then filled in the according SIP account information to finish the registration. After configuration, save and reboot are required to take effect. Please use the same method to finish other CyberData Devices’ registration. Since you are the administrator of this paging system, you are using the IP Phone to conduct paging action, you can directly paging to any end point by dialing the relevant extension number of CyberData device. You can use IP Phone to dial extension 304 directly, then CyberData SIP Outdoor Intercom will auto answer the call, then IP phone can start paging and communicate with the person who stands in front of the intercom and vice versa, the SIP intercom of CyberData can establish a conversation with IP phone by dialing the extension number of the IP phone 300. Notice: The SIP Paging Adapter has no speaker, but you can connect an Audio Amplifier and speaker to conduct paging. You can use IP phone 300 to dial the extension number of the paging adapter 302 directly, after hearing a BEEP sound, you can start to page. The CyberData SIP Paging Amplifier supports to register a SIP account, and finish the paging by directly dial the extension number 303 using IP phone 300. CyberData Speaker is able to register as a SIP extension of Yeastar IPPBX. You can directly page it by dialing its SIP account 306 using IP phone 300. CyberData SIP Paging Server divides the whole paging area into 100 paging groups, different paging groups are distinguished by 2 digits zone number from 00 to 99. With the specific paging zone number selected by broadcaster, the voice is paged to a specific page address in the LAN. For example, in this guide, we setup 2 paging groups 00 and 01 as below. Fill in the Address: 234.2.1.1, and the port as 11000 to finish setting up for Group 00. Please edit the Paging Group #1,and fill in the address 234.2.1.2, and the port as 11002 for setting up Group 01. In the group 00, we assign SIP Paging Amplifier and SIP Paging Adapter as the members. Now we are going to set up the multicast for them. For example we setup the SIP Paging Adapter. Log on the WEB page and go to the page Multicast. Enable the Multicast Operation and fill the Address and Port with the Group 00 information in SIP Paging Server setting. Now, we have set up the SIP Paging Adapter as the member of Group 00. Please configure others CyberData Paging end-points in the same way. 1. Make a call to SIP Paging Server 301 using IP phone 300. 2. The SIP Paging Server will answer the call automatically, and play a prompt “Enter the 2 digits zone number”. 3. You can enter 00 to page paging group 00, and enter 01 to page group 01. Each CyberData end-point and SIP Paging Server support 2 SIP extensions, primary extension used for paging, and the secondary Nightringer is used to play a ring tone when a SIP call is made to the nightringer extension. The nightringer extension usually is in the same ring group including a SIP Phone in PBX, the ring tone is a notification to users in the area that there is an incoming calls, then users can pick up the SIP phone to answer the calls, once users answered the call, nightringer extension will stop play the ring tone. At the non-business hour, if there is an incoming call from outside, then PBX will route this call to the ring group which consist of CyberData nightringers and IP Phones registered to the internal extensions of PBX. All the end-points of this ring group will ring, nightringer extensions will play a ring tone to the working area through CyberData devices, to make users in the area notice that there is an incoming call, and they can reach the IP Phone and answer the calls. Register CyberData End-points to Yeastar IPPBX. 2. Configure Ring Group in Yeastar IPPBX. 1. Create a ring group including all the CyberData Nightringers and IP phones. 3. Route the incoming calls to Ring group at non-business hours. Cyberdata is a very good product. In Canada we see a lot more of the Algo product being deployed. It could be because Algo is a Canadian company and so more readily available through distributors here. I've created a YouTube video about how to configure the Algo paging device with the Yeastar S-Series Phone System. I hope some can find it useful.